Online multiplayer has stopped working due to GameSpy services being shut down. Includes Act of War: High Treason. 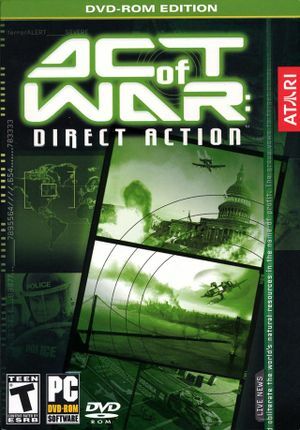 Open <path-to-game>\ACTOFWAR.EXE with a hex editor such as HxD. Find the bytes 83 C4 F4 close to Offset 0x5AE3F0 and replace them with B0 01 C3. GameSpy GameSpy master server has been shut down. ↑ 1.0 1.1 File/folder structure within this directory reflects the path(s) listed for Windows and/or Steam game data (use Wine regedit to access Windows registry paths). Games with Steam Cloud support may store data in ~/.steam/steam/userdata/<user-id>/2710/ in addition to or instead of this directory. The app ID (2710) may differ in some cases. Treat backslashes as forward slashes. See the glossary page for details.